In 1921 as America prepared to shake off the calamity of the Great War and enter the Roaring Twenties, a small group of ex-Officers of the British Armed Forces living in Boston gathered at Young's Hotel to form a social club designed to strengthen the bonds of goodfellowship arising out of their respective services during World War One and to foster the friendship existing between Great Britain and The United States. Boston is perhaps the American city with the strongest ties to Great Britain. Visit Virginia where many engagements of the Revolutionary War were fought and one cannot help but to see the focus on the American Civil War, another crucial period of American History. Yet here in New England, the links to England have always been celebrated and it is hard to go anywhere in New England without being reminded that before our countries were able to establish an unbreakable alliance, we first had to settle our differences. In 1921 Boston was a haven for many ex-servicemen for whom the trenches of Belgium and France were still a vivid memory. Britain has been badly shaken by the war, losing over 2 million men and the Country would never be the same. For many ex-servicemen, emigration to the New World offered a simple way to get away from the memory of the War. As immigration laws were not as strict at the time, it was not long before a sizable community of ex-servicemen from England, Scotland, Wales, Ireland, Canada, Australia, New Zealand and many other Commonwealth Countries were established in Boston. Many wanted to forget the war, but many wanted to stay in touch with comrades and retain a line to the Old World. 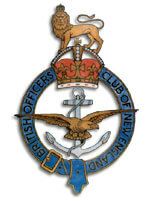 In this spirit the British Officers' Club of New England was formed. The 1920's saw the popularity of the club soar. Almost simultaneously, the British Officers' Club of Philadelphia was formed and the two clubs both prospered and generally sponsored an inter-club event on an annual basis. The BOCNE provided a social outlet for those who had served in the Officer Corps of any of His (at the time it was the King) Majesty's Services and also provided a small dose of the life one had left behind. The BOCNE would sponsor Cricket matches to the bemusement of the locals who were used to the bats being swung above the shoulder rather than down by the feet. Meanwhile, the popularity of the Club continued to grow as many US ex-Servicemen who had served in the war and spent time in England found the BOCNE an agreeable and welcoming club. Yet as quickly as the Club grew, the good times were not destined to last. Only eight years into the existence of the Club, Britain and America entered a period of darkness which would cast a shadow not only over themselves but the World. Ironically, the BOCNE would perform probably its greatest work during the later years of these trying times. First of course, came the Depression and with it the breadlines and unemployment bringing misery to thousands. On the heels of this came the terrible menace of Nazi Germany. Aided by a Britain willing to do almost anything to prevent war and an America in the throes of isolationism, the rise of Hitler eventually saw England and her Commonwealth (or Empire as it was then) Allies once again at war with Germany. If the Battle of Britain was "the finest hour" for the brave pilots of the Royal Air Force, then the War of the Atlantic in 1941 - 1942 was most certainly the shining moment for the BOCNE. Boston was a key port for supplying Britain with raw materials under the "Lend-Lease" program devised between Roosevelt and Churchill. The convoys would pour into Boston, and the exhausted seamen of the Merchant Marine and The Royal Navy, having faced death on a daily basis from the ravages of the Wolf Packs of Germany's Kriegsmarine, looked for a place of comfort and welcome. The BOCNE entertained thousands of these brave souls, gave them what comfort was possible, a friendly face, a pint of bitter and often as not lodging, before the ships, loaded with supplies, made the dangerous return voyage.Today we are often surprised to learn that U-Boats lurked not far outside Boston Harbour and Georges and Great Banks and were potential graveyards for the many ships who kept Britain fighting during the war. The bombing of Pearl Harbor in 1941 and the entrance of America into the War kept the BOCNE busier than ever. British Warships were less common during the Atlantic War as their presence was needed elsewhere, but when the US and Royal Navies combined to defeat the U-Boats and the effects of Lend-Lease began truly to take hold, more Royal Navy ships were able to make the full trip escorting convoys from Great Britain to Boston. Boston was very much a Navy town and there was no shortage of Officers from the many countries united to defeat the evil of Nazism, who needing to enjoy a brief respite from the War, were entertained at the British Officers' Club. During this period, members and volunteers kept the premises at The Parker House open every evening, and before the end of the war, over 13,000 had been entertained. Mr.Ronald A.Forth who was President of The Club for most of this period was awarded The King's Medal for his services and those of The Club in aid of Britain's war effort. In addition, during the war, The Club became actively associated with The British War Relief Society and assisted in the raising of funds that enabled The Society to send a "Rolling Kitchen" and a "Bombproof Club Room" to the people of Great Britain. The kitchen, which bore The Club's inscription, was placed in use about March 1940 and saw extensive service particularly during the Battle of Britain. The Club Room went into service during the summer of 1941 in Bristol, fully equipped for the happiness and safety of the children using it. The room bore a plaque inscribed "As a token of appreciation to the young people of Britain, from The British Officers' Club of New England". With the end of the war the BOCNE reverted to its objectives of promoting relationships between the British Commonwealth of Nations and the United States of America and between The Club and members of other British Societies and Clubs in New England and throughout the United States. Changes of location of The Club's Head Quarters have been necessary since the end of the war, but since 1995 The Club has had its Mess in The Paine Room at The Union Club in Boston where informal gatherings are held every Wednesday. Changes in The Club's Constitution now provide that membership is open, on an Associate basis, to a restricted number of those who are not qualified under the rules for eligibility but are in sympathy with the objectives of The Club. Notwithstanding all of these changes, the original purpose of The Club, as stated more than ninety years ago, is still the keystone and objective of its members.